N53 Protein Matrix (Milk Protein Isolate, Whey Protein Isolate, Pea Protein Isolate, Sodium Caseinate, Micellar Casein), Resistant Maltodextrin (Fiber), Evaporated Cane Juice Solids, Inulin Fiber (from Chicory), Alkalized Cocoa Powder, Sunflower Oil, Maltodextrin, Natural Flavors, Canola Oil, Taurine, Gum Blend (Xanthan Gum, Cellulose Gum, Carrageenan), L-Glutamine, Sea Salt, Potassium Citrate, Sodium Citrate, N53 Fruit & Vegetable Blend (Drum-Dried Watermelon, Drum-Dried Cranberry, Dehydrated Broccoli, Dehydrated Carrot, Drum-Dried Pomegranate, Drum Dried Blueberry, Beet Powder, Dehydrated Spinach, Dehydrated Tomato, Dehydrated Parsley, Mangosteen Powder, Freeze-Dried Acai Powder, Goji Powder, Dehydrated Cabbage, Freeze-Dried Apricot Powder, Freeze-Dried Mango Powder, Freeze-Dried Pineapple Powder), Stevia Extract, Green Coffee Berry Extract, Digestive Performance Blend (Protease, Amylase, Lipase, Lactobacillus Acidophilus). Blender: Combine 2 scoops of Lean1 with 6-8 ounces of cold water and 8 ice cubes. Blend for 1 minute. Enjoy! Glass: Combine 2 scoops of Lean1 in a glass with 8 ounces of water. Stir vigorously. Then add 4 ice cubes and stir. Enjoy! Shaker: Combine 2 scoops of Lean1 with 8-10 ounces of cold water and 4 ice cubes. Shake for 1 minute. Enjoy! N53 Protein Matrix (Milk Protein Isolate, Whey Protein Isolate, Pea Protein Isolate, Sodium Caseinate, Micellar Casein), Resistant Maltodextrin (Fiber), Evaporated Cane Juice Solids, Inulin Fiber (from Chicory), Sunflower Oil, Maltodextrin, Natural Flavors, Canola Oil, Taurine, Gum Blend (Xanthan Gum, Cellulose Gum, Carrageenan), L-Glutamine, Sea Salt, Potassium Citrate, Sodium Citrate, N53 Fruit & Vegetable Blend (Drum-Dried Watermelon, Drum-Dried Cranberry, Dehydrated Broccoli, Dehydrated Carrot, Drum-Dried Pomegranate, Drum Dried Blueberry, Beet Powder, Dehydrated Spinach, Dehydrated Tomato, Dehydrated Parsley, Mangosteen Powder, Freeze-Dried Acai Powder, Goji Powder, Dehydrated Cabbage, Freeze-Dried Apricot Powder, Freeze-Dried Mango Powder, Freeze-Dried Pineapple Powder), Green Coffee Berry Extract, Stevia Extract, Digestive Performance Blend (Protease, Amylase, Lipase, Lactobacillus Acidophilus). 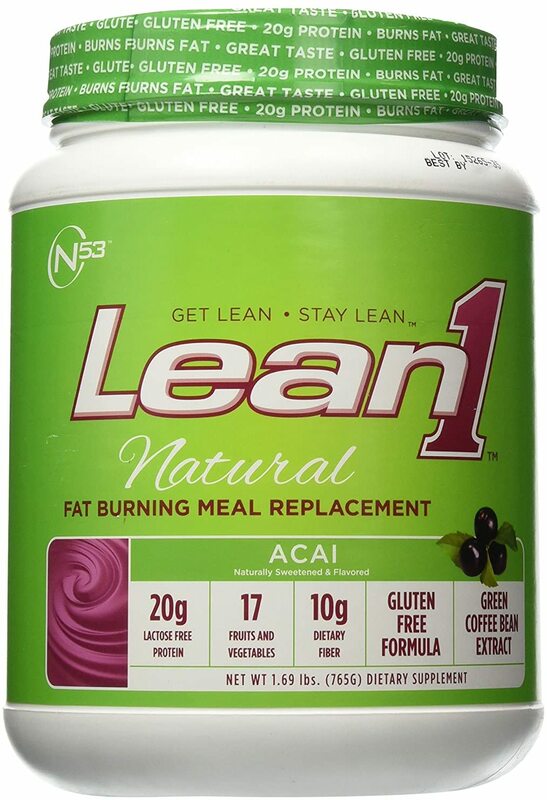 Get lean and balanced nutrition with the Lean1 Fat Burning Meal Replacement. You'll notice the Lean1 difference right away. The incredible taste, the energy and the satisfaction of knowing that you're giving your body the right balance of nutrients to help you look and feel your absolute best each and every day. -Antioxidant Protection: Boost antioxidant power with 17 fruits and vegetables including super fruits like acai, mangosteen and goji, along with 27 vitamins and minerals and 1000 IU of vitamin D.
-Healthy Digestion: Lean1 promotes natural gut health with the combination of 12 grams of fiber, lactose free proteins and proteolytic enzymes that work synergistically for healthy digestion. 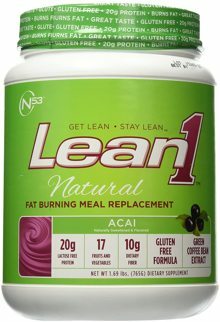 -Helps Burn Body Fat Faster: Green coffee bean extract has two beneficial ingredients for weight loss which are caffeine and chlorogenic acid. Lean1 gives you both energy and healthy weight loss. -Tones and Defines Muscles: Nutrition53's protein matrix made of whey isolate, milk isolate, pea isolate, micellar casein and sodium caseinate helps to define lean muscle. -Curbs Hunger Cravings: Bioactive nutrients like fiber, milk protein isolate and amino acids work together while losing weight to help you feel full, satisfied and energized without feeling hungry.